Dimensions (HxWxD): 6.6" x 1.35" x .85"
This brilliant AAA quality natural, unpolished 6.6 inch long AAA Growth Interference Laser Wand, weighing 218.3 grams, is from Diamantina, in the state of Minas Gerais, Brazil and is virtually flawless. This highly etched Diamantina Growth Interference Laser Wand exhibit remarkable internal clarity. Temple markings cover the length of the shaft. The termination tips are basically flawless. The formation, the clarity, and the unblemished condition of this specimen are absolutely top quality. And, it feels wonderful in the hand. The scintillating clarity of this Diamantina specimen cannot be overstated. The pictures on this page cannot do this piece justice. 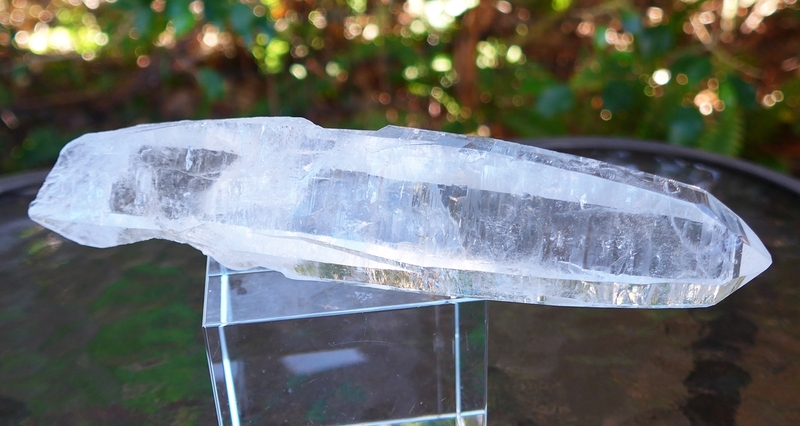 It is a true mineralogical collector's item as well as a Lightworker's power tool. 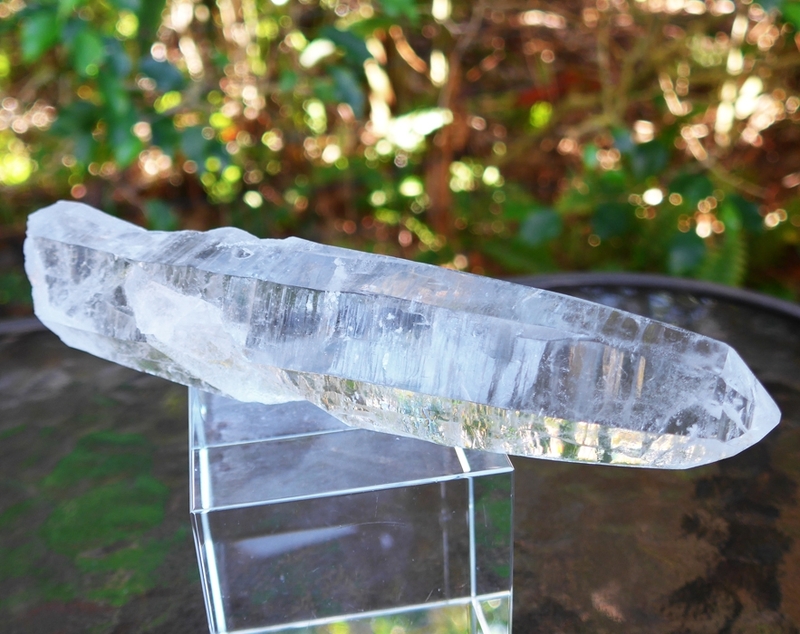 The energy signature of this outstanding and unique quartz crystal is like the energy of a clear cold mountain stream, high above the treeline. 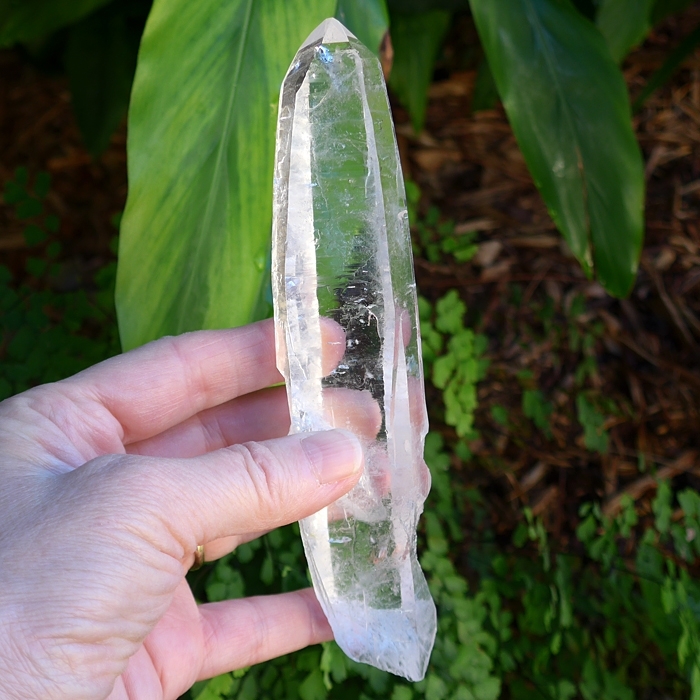 This is a perfect crystal for cleansing, clearing and recharging work, for healing and for meditation. 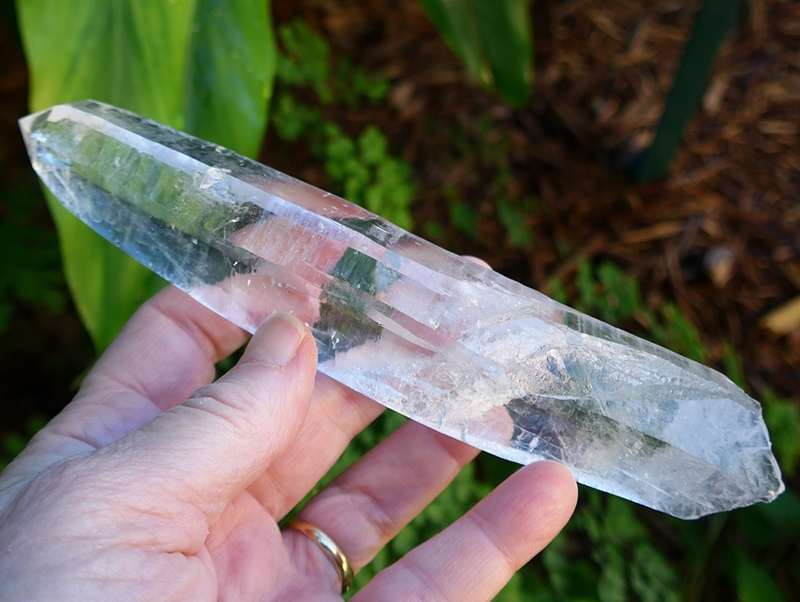 This gorgeous, unblemished water clear Diamantina Laser Wand will be an energizing presence on your altar, desk, or side table, in your den, office, or bedroom, and it's just the right size to hold in the hand for crystal healing work or during meditation. Growth interference crystals are created when calcite formations adhere to the crystallizing quartz rhombohedron (six-sided crystal), then disappear over time. 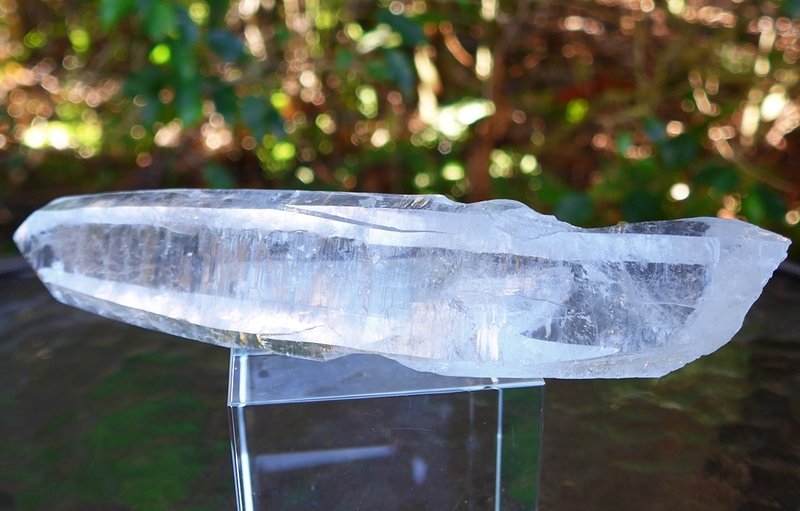 This results in long indented grooves along the prismatic faces of the quartz crystal. 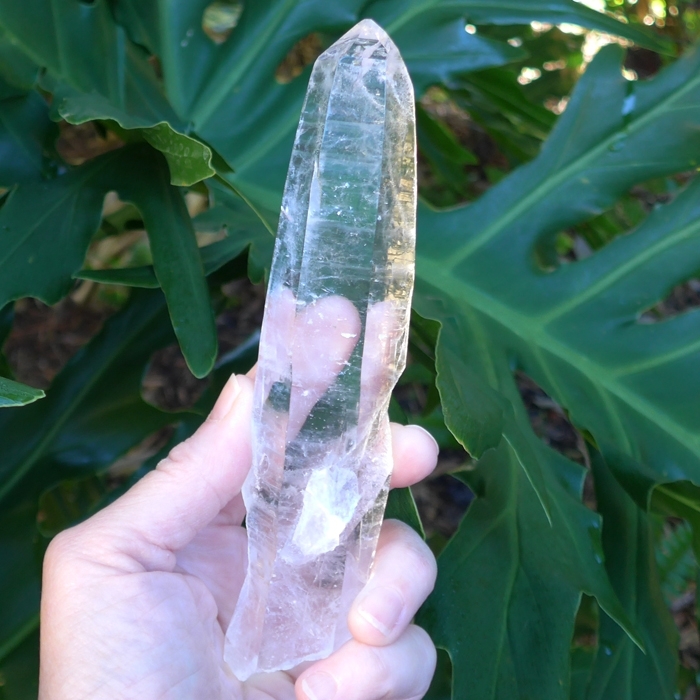 Growth interference crystals are typically used to enhance understanding of blocks we encounter in our quest for emotional, physical, or spiritual growth, and to gently remove these stuck energies, representing old and outdated mental conceptions of the world, recurring patterns of negative behavior manifesting in relationships, negative emotional reactions to life conditions, and physical impediments to health and well-being. Note: Weight above is shipping weight. Actual Weight is 218.3 grams or 7.7 oz.